All limbs must be curbside by 7:00am Monday morning the week of pickup. There will be no double coverage; once we go through your area we will not be back until the next scheduled pick-up. Maximum size of limbs to be discarded is 8″ in diameter and can be 12′ to 15′ in length. This is not a tree removal program. If you are removing entire trees larger than 8″ diameter, you will have to hire someone to dispose of them. Please stack all piles cut end towards the road. Please separate into piles not just one large pile no more than 3 feet high and orderly. Do not stack logs on branch piles make a separate pile. All small clippings can be placed in a garbage can or brown yard waste bag but NO stones or soil. No yard waste (grass, flower clippings, or leaves). All bushes and root balls will be accepted if free of soil. 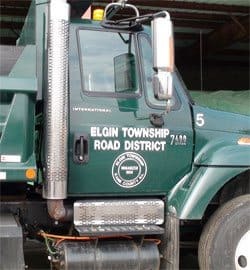 Wood chips are available to homeowners residing on township maintained streets. We will deliver. Do not park cars on the road or road right-of-way in the winter months. Plowing snow from your driveway and leaving it on the roadway is a violation of Illinois State Statute. Township employees take great pride in their snow removal routes, your cooperation will help them do their job more efficiently.